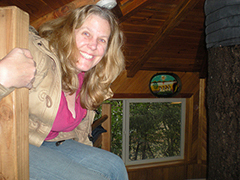 Cynthia Sue Larson celebrating life in a treehouse in Oregon. See Cynthia summarize this RealityShifters on YouTube! Happy New Year! I love the feeling of getting a fresh start in life every time I move to a new place, start a new project, and start a new year. I love the sense of fresh energy and hopefulness and the feeling that anything is possible! When we celebrate these turning points in life, we get a terrific energetic boost. New year's resolutions don't have to be entirely focused on restrictions and constraints... it is possible to take our positive intentions and transform them into ongoing celebrations that continually inspire us to be and do those things we desire when we focus on what most excites, tantalizes and enthuses us. Thinking about and taking steps forward according to such positive ideas is invites us on a celebratory journey through life,. One of the ways I celebrated life this past month was by spending a night in a beautiful treehouse, comfortably situated some thirty feet high in the air, surrounded by beautiful trees. 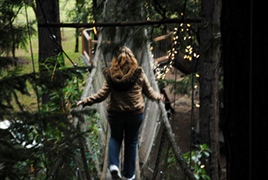 I had longed to stay in a treehouse since I was a little girl, so this experience was tremendously meaningful to me. There is a special kind of joyful feeling from such an experience, which stays with me long after my time in that enchanted treehouse is gone. This time of a brand new year is a perfect time to think about celebrating life in ways that truly make you happiest, based on what you've come to know about yourself. At the start of this new year, this is a great time to imagine it will be in your life within the next year... and write it down in a special journal of what you are thankful for, what you are dreaming of, and what you desire. There is something marvelous about combining a gratitude journal with your favorite hopes and dreams, and I have found that things I write down in such a book come true amazingly fast and easily. If you are grateful that you have a really good friend, give some thought to that special friendship, and write a sentence or two about what you love most about your friend. If your health is good in some ways, take some time to feel gratitude for all the things you are able to do. If you'd love to travel somewhere, or spend time in a special place, imagine yourself in those places, and write down a description of being there. I invite you to celebrate life this year in two fabulous ways... by having fun with more money and better health! I hope you will read and enjoy my new brand new book, RealityShifters Guide to High Energy Money, as it inspires you to thoroughly enjoy finding, keeping, and growing your finances with inspirational stories of real life monetary reality shifts. I am also thrilled to invite you to join me in the I Am Healthy Project by declaring the powerful affirmation, "I am healthy." The target for this project is to start off by generating a critical mass of one million people who are all aligned with the same powerful and transformational idea... an idea that has the power to transform the world. Would you like to view the video summary of this RealityShifters on YouTube? Feel free to check it out, as well as video shorts summarizing other recent RealityShifters newsletters. And remember to keep asking, "How good it can get?" every time you'd like to find out. is now available in ebook version! Discover a fresh new way of thinking about high energy money! is now available in Kindle edition! This empowering booklet describes the ten things your energy field does for you, explains why some days feel better than others, and provides tips for making every day the best it can be by harnessing the power of your bioenergy field, or aura. 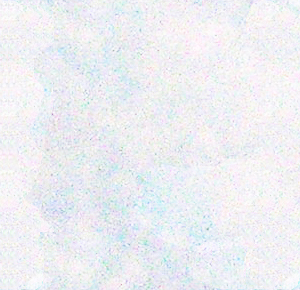 This video features highlights from a 2005 aura workshop presented in San Jose, California. This video begins with an introduction by Guy Coggins, of Aura Imaging Systems, followed by a first-person near death experience account by Karen. 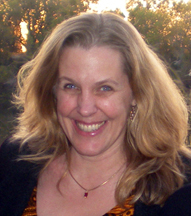 Cynthia Sue Larson talks about “Get the Aura Advantage” starting about 20 minutes in and ending around 1:04, and the video closes with Sandy DuVeau talking about aura photography. Can you imagine having hope for the past? With new models for understanding how the future can affect the past, it becomes clear that the various alternate histories of the universe that have already occurred depend on the exact questions we ask right now. Many intuitive hunches and insights come from our future selves, who with 20:20 hindsight enable us to avert disaster. We can contemplate premonitions as being part of an on-going dialogue between possible pasts and possible futures. This article summarizes some of the main points presented by Cynthia Sue Larson at the 12th Annual International Language of Spirit conference on the topic of retrocausality. 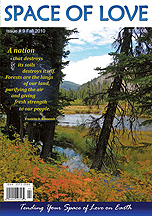 This magazine can be ordered for US $7.95 per issue, or viewed via online subscription at the Space of Love Magazine web site. 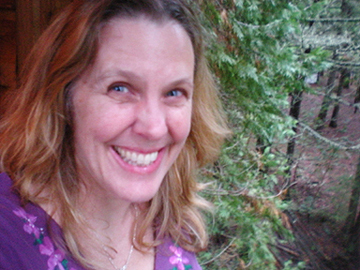 Listen to I Am Healthy Radio Host Romel Axibal interview Cynthia Sue Larson as she recounts her own transformational journey, and as she discusses working with a knowledge of physics and medical intuition to help people transform from illness into health, and as she describes several moving testimonials in which people have experienced healing through reality shifts. These interviews are part of the I Am Healthy University i-Heal Education Series. My husband is afraid of my mental health, therfore I am happy to be able to write about my experiences here. I have had two reality shifts recently, and it is so funny... so peculiar, I think, but I have no one to share it with. The first one: I have a beautiful necklace in a small box, which I keep in a drawer in a cupboard. One day I wanted to put it on. I went to the drawer, and found the small box empty. I then looked everywhere I could possibly have put it, with no result. I got a bit nervous because I got that beautiful saphhire stone necklace in Thailand for my 60 years birthday from my husband, and would hate to have lost it. Finally, after some time where I tried not to panic, I went back to the drawer, and suddenly there were two boxes: The empty one again, and the one with my necklace. I must laugh because I was so released and happy! The second thing was not very expensive but the loss of a button which I had promised to sew in a jacket for my son. I knew I had put it on a trayer beside some glasses with vitamines on a table near the window where the light comes in, and where I usually sit when I repair things. But it was not there when I decided to sit down and mend the jacket. I took all the glasses away, and the trayer remained empty. This time I didn't get nervous but thought: Well, the button must have fallen out of the window, I'll find it when the snow has melted. Otherwise I have to look for another button. Then later that day I passes that place, and in fact: There it was, exactly where I put it in the first place!!! Now I am excited to discover what will disappear next time! I just wonder where the things hide, when we cannot see them? Another thing I feel like mentioning is the strange and amazing feeling af joy and excitement I have, when the things come back. I take it like a confirmation of what I know: That there is a reality outside myself. 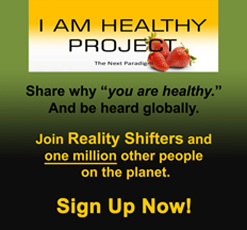 Note from Cynthia: Thank you so much for sharing these reality shift stories. I can empathize with losing a favorite gem stone necklace, and also the joy in discovering it has returned! I've lost jewelry before and had it reappear, and I remember how immensely relieved I felt when it came back. I don't know where these things go, but to me it often seems like it's another parallel universe in which things are almost, but not completely the same as the one I'm currently in. I know what you mean about those feelings of joy and elation -- it also feels to me like confirmation that for sure there is much more to the universe than what we take for granted! A mildly strange thing just happened, and I know of nobody else to tell it to (unless I were in the mood for shrugging and/or preaching about the dangers of distraction, which I am not), so I want to tell it to you. It's nothing, really, but it's funny. About two hours ago I went into my kitchen to fill a bucket with hot water. (It needed to be hot.) The bucket is big, so it takes a while to get it filled. After 20 - 30 seconds or so I thought the bucket felt strangely cool. I touched it, stuck my fingers in the water - it was stone cold (well, cold water-cold, really). I had been pouring cold water instead of hot. I was annoyed because such things don't usually happen to me, so this event took me by surprise. Anyway, I turned off the faucet - the LEFT one, which in my house is, and always has been, the cold water faucet - put the bucket-full of cold water away (I conserve water, so I decided to use it for something else) and went to fetch another bucket. I filled the second bucket with hot (very hot) water - yes, I checked :) - and put it away, to cool off just a little bit. As I walked to the other side of the kitchen, my bare leg brushed against the first bucket, the one with cold water, that I had put away. I thought it had felt unusally warm, but chalked it up to the thermal fluctuations of the weirdness that is winter. :) But then I stopped and went back to check that first bucket. I felt the outside of the bucket - it was warm! I stuck my finger in the water - it was WARM! At this point I could go on and on, elaborating on the details of this little nothing... but what for? What happened seems pretty simple if inexplicable: I filled a bucket with cold water flowing from the cold water tap; I felt it - it was cold. Not lukewarm - cold. Minutes later, the water in the same bucket was very warm - so warm (around 37 Celsius) that it could not possibly be a mere impression of warmth due to the differences in temperature that my hand has been subjected to. I am familiar, as we all are, with the fleeting feeling of apparent - relative - warmth (or coldness) due to a difference in temperature only. This was not it. This was genuinely WARM water - so warm that the outer surface of the bucket had warmed up. It was as warm as it had been cold only a few minutes before. I have no known neural disorders, and I am under no influence of drugs, alcohol, etc. I am also an extremely rational person who enjoys finding out the mysterious - but "logical" - ways of nature. However, my very reason compels me to admit the evidence of several "strange" (logically inexplicable) incidents in my own life, and to admit that sometimes the physical world does not obey to the usual "laws" of cause and effect that seem to rule it. I don't know how to explain this event; I have no idea how is it even possible. But it did happen. And yes, it definitely wasn't the "relative temperature" feeling! It was COLD - and I also visually remember turning off the LEFT faucet. Also, I wouldn't have filled it with warm water - I was going for HOT. (And the second bucket was indeed so hot that it had to cool off.) I am glad I wrote about this, because in time, I am sure, I would start doubting my own memory of the event, and eventually would probably come to think that something mundane must have happened. As it is, I wrote it down less than two hours after it happened, after having spent practically all that time thinking about it and going over the sequence of events. :) I don't know what exactly the value of such events would be for others, but I am sure, if nothing else, they could help shift the entrenched illusion that we know how the world really works, at all times. We don't. Thank you for your fabulous work! Note from Cynthia: Thanks so much for sharing this story with me about the bucket of cold water turning warm. I can definitely relate to your experience, as I've encountered reality shifts in which control knobs (for a laundry machine, and for water faucets) have been completely different than they had been before. In this case, however, it seems the water itself transformed from cold to warm, and that is a fascinating reality shift! I have a fun reality shift story - I went dancing half a year ago, and one of the guys I danced with was a really great dancer, he was spinning me around sort of 50's style which was funny because the music wasn't 50's at all! at the end of dancing we went outside, and it seemed like he was going to try to kiss me, I didn't want to since we just met, so I sort of dodged it - we went our separate ways and only talk online once in a while - he's a music producer and he travels a lot for work. Then out of the blue 3 nights ago I had a dream he was kissing Drew Barrymore and they were both dressed up like they were in the 50's. It looked like he was going to swallow her face! hahahaha - It was so vivid and weird because I haven't seen him or a Drew Barrymore movie in forever! So I emailed him to tell him, and he said he just met her a month ago at a party!! RANDOM HUH! lol What kind of dream telepathy is that?! Note from Cynthia: I love this story of dream telepathy! I find dreams are often one of our best ways to be tuned in on the "innernet" levels where we are all connected with one another. In some ways, dreams can feel like they set the stage for or help create the physical reality we subsequently encounter, and many a deja vu experience can be traced back to an earlier dream. I particularly like the way the information you got from your telepathic dream was not even something you'd normally ever hear about... with an almost random, playful sense to it. And how marvelous that you were able to follow up and confirm that there was an element of truth to the dream! I've not been able to find any original material regarding the story of Tahitian people not able to see Captain Cook's ship. I like the story but it seems to be legend (are legends partial realityshifts?). Does your book list original source material for this story? Sadly I'm finding many good "new age" stories are fictional parables or scrambled history rather than accurate historical events, things like quotes people didn't say or events that never occurred. I find stories repeated on the Internet so often accurate records are hard to discover. Of course the case can be made that the actual events don't matter and the story can be treated as parable. But I find that kind of thinking leads me down the road to spiritual nihilism; nothing matters but everything is significant; nothing inherently has meaning except what we assign; why bother with anything since we are already complete and everything is good. I suppose it all comes back to the question of what is reality. Maybe your book can help me find clarity, I'll get a copy as soon as I'm able. The Highly Sensitive website explores the gifts and challenges of being a highly sensitive person, and does so with style, insight, compassion and grace. Erase Negativity is a powerhouse of a self-help book. It features eleven chapters describing life lessons mastered by people who've overcome extraordinary challenges. The big idea here is that no matter what terrible things may have happened in life, it is always possible to start from exactly where we are, and begin moving in a positive direction toward the life of our dreams. The first couple of chapters of Erase Negativity may seem shocking, as they describe how it feels to pull oneself up by the proverbial bootstraps while "emerging from the depths of hell," such as an addiction to drugs, alcohol, or cycles of emotional and physical abuse. I was deeply moved to read heartfelt stories of people who have truly hit rock bottom, and managed later to set and achieve positive goals. It's inspirational to read how people have bounced back from a wide variety of horrendous situations, and managed to get unstuck from complacency. There is greatness possible for each and every one of us, regardless what handicaps, constraints, and misfortune may have occurred. I love the format of this book, as each chapter starts with a biographical story that illustrates the tools required at each person's turning point. The end of each chapter summarizes the main points in the form of exercises first for erasing negativity... and then for embracing "the magic within." The magic referred to is spiritual, intuitive, and energetic in nature, rather than a form of magick or witchcraft. The life-transforming tips provided in Erase Negativity include feng shui, keeping a running total of positive to negative thoughts, affirmations, stepping out of the victim mindset, setting positive goals, choosing supportive friends, eliminating gossip, and practicing mindfulness. These concepts are much more than mere words on a page, as real life accounts of what a difference they have made are described eloquently. I feel deeply honored to be one of the eleven people interviewed for Erase Negativity, and I sincerely hope that my story will resonate with readers in ways that help them gain additional strength to succeed in life. Erase Negativity and Embrace the Magic Within is the best summary of how to live a positive life that I've yet found in a self-help book; I give this book my highest recommendation!